The filming puts the participants to grueling tests, both physical and emotional. To reach the skeletons at the base of the Las Calaveras cenote, for example, people and bulky equipment have to pass through a roughly one-square-meter opening. Director Norbert Vander isn't afraid to get his hands dirty, climbing over moss-covered, slippery rocks along the edge of the hole, issuing commands, swearing and sweating. The temperature in the jungle is around 30 degrees Celsius (86 degrees Fahrenheit), and the air is as humid as in a Turkish steam bath. "You could play a cello on my nerves," says Vander. The 3-D underwater camera, a sinfully expensive, one-of-a-kind device, dangles on a pulley in front of him. Assistants slowly and carefully lower the 80-kilogram (176-pound) camera, as it dangles only a few precarious centimeters from the edge of the hole. Vander directs the rope himself, as drops of his sweat fall into the pit. When the box-like housing finally slides into the water and into the hands of the waiting divers, everyone applauds. The film team dragged the camera and hundreds of pounds of equipment through the jungle for three weeks. 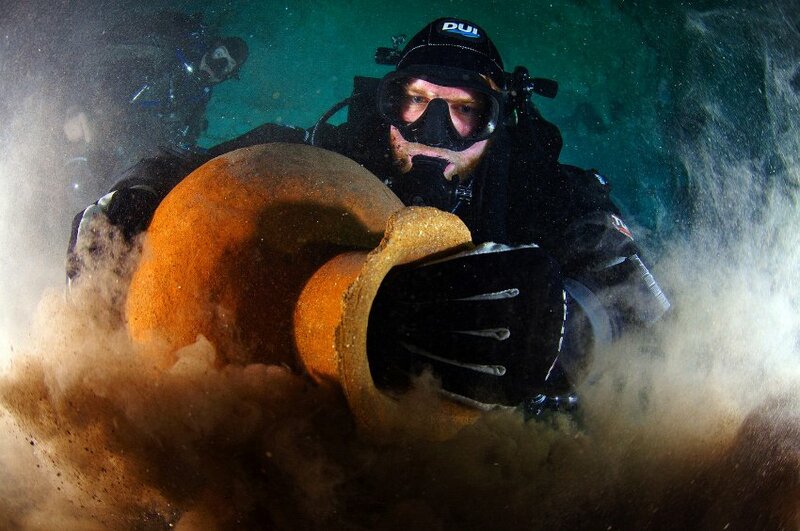 Four research divers from the northern German city of Kiel handled the tricky job of filming underwater. Diving in caves is already more dangerous and technically challenging than anywhere else. But with an 80-kilogram camera, lots of lights and constant changes in the diving depth, it becomes backbreaking work. For team leader Florian Huber, from the University of Kiel's Institute of Prehistoric and Protohistoric Archaeology, every minute is a worthwhile investment. "The documentation of these caves is fundamental research," Huber says. "It enables us to take stock of things before we can ask further questions about individual objects." This sort of stocktaking seems urgently necessary, especially in the Mexican underwater caves, where halfway systematic exploration began only a few years ago. The Las Calaveras cenote, with its roughly 125 scattered skeletons, is only the tip of the iceberg. Scientists are still completely in the dark when it comes to what remains to be discovered in the many caves that haven't been explored yet. "Some 3,000 to 5,000 cenotes are known today, but there is an estimated total of up to 10,000," Huber says. "Only a tiny fraction of that has been explored so far." The fact that the caves have already produced spectacular treasures, including some of the oldest human remains found in the Americans to date, suggests that archeologists will find more. In fact, the number of finds grows with almost each new cave that's explored. In prehistoric times, man was already burying the dead in the dark underworld. When sea levels rose dramatically after the last ice age, about 10,000 years ago, the water level in the caves, which are connected to the Atlantic, also rose. 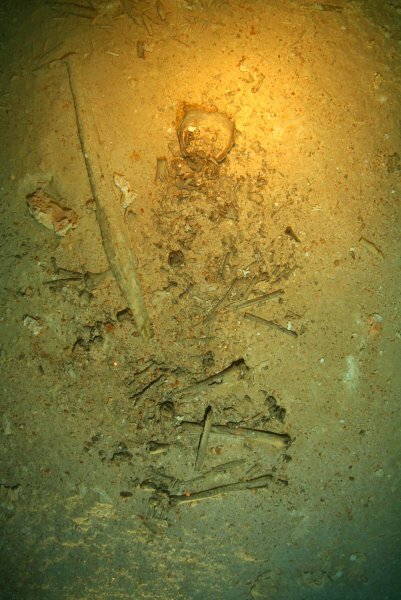 Skeletons, fire pits and tools from the Stone Age gradually became submerged. Later, the Mayans, who lived in the region from about 3,000 BC until 900 AD, threw ceramics and jewelry -- and people -- into the cenotes. Their remains survived the ages just as well as those of long-extinct animals, such as the giant ground sloth and the mastodon. "Perhaps the cenotes contain the answer to the questions of when the first humans reached the Americas and how the continent was settled," says Huber. Water even preserves things that would have disappeared within a short time on dry land. In the Toh Ha cave system, for example, scientists stumbled upon both the 10,000-year-old bones of a boy and a fire pit roughly 8,500 years old. "It looked as if there had been a fire there just the day before yesterday," Huber says. Exploring the caves is extremely cumbersome. Finding them in the middle of the jungle is difficult enough, but exploring them is considered one of the most challenging and dangerous jobs a diver can take on. Only their lamps keep them from being left in complete darkness and often have to squeeze through narrow openings. If they churn up too much sediment in the process, visibility in the otherwise crystal-clear water can suddenly drop to zero. Some cenotes are more than 100 meters (328 feet) deep. Normal compressed air is no longer sufficient at these depths. To avoid nitrogen narcosis and oxygen poisoning, cave divers use other products, including Trimix, a mixture of oxygen, nitrogen and helium. If they encounter problems despite the many precautions, rapid ascents are not possible because divers have nothing but rock above their heads. 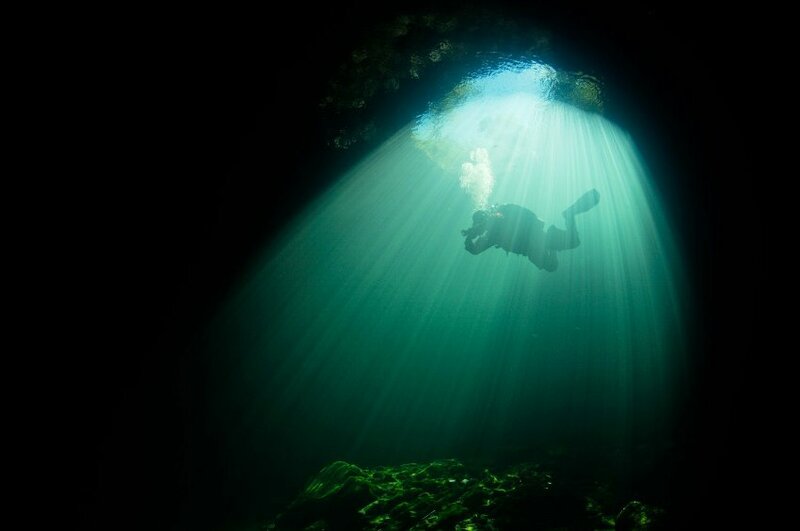 "Sometimes we penetrate more than a kilometer into a cave," says Uli Kunz, an underwater photographer and biologist. "If, under these circumstances, you calculate your air supply incorrectly, get lost or panic, you're as good as dead." The Kiel-based dive team, which has been working in Mexico's caves since 2009, started using modern imaging technology in 2010. Some 63 square meters of the Las Calaveras cenote were recorded using photogrammetry, and wraparound photo series of individual relics were processed into 3-D models on the computer. "This is a powerful tool for research," says Guillermo de Anda of the Autonomous University of Yucatan, the leading expert on Mexican cenotes. Of course, he says, some finds still have to be recovered, such as when scientists want to perform genetic analyses of chemical dating procedures. "But a lot can be discovered with 3-D models, without even touching or possibly destroying the find," he says. 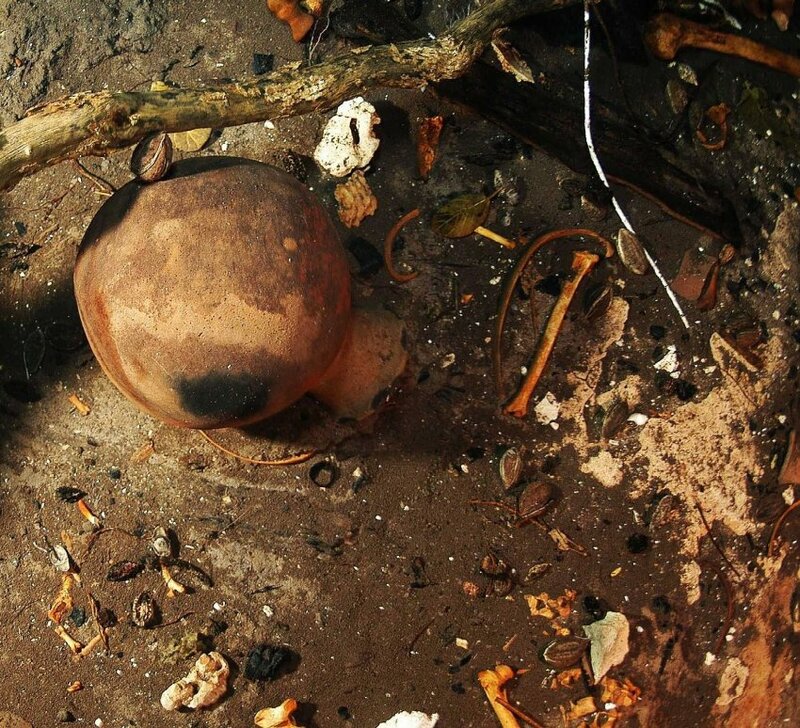 The method also enables archeologist to evaluate relics without having to dive into cenotes. Likewise, it offers benefits to the few experts on antiquity who are also research and cave divers. "Underwater, you can usually spend only a few minutes with the finds," says de Anda. "But, on the computer, you have all the time in the world." Other high-tech methods are also suited to exploring the world of caves. Laser scans taken from the air, for example, make it possible to eliminate entire forests on the computer. Scientists have used this method to find overgrown Mayan infrastructures, which in turn point to cenotes. Making the planned documentary is even more complex than preparing computer models of individual relics. Previous models of 3-D film cameras, including their underwater housings, were almost as tall as a man and weighed hundreds of pounds. Using them in the narrow caves would have been unthinkable. Specialist companies from Hamburg and Kiel designed and created a camera housing that was small and lightweight enough. "It took half a year just to develop and build the housing," says Peter Baaten, the film's producer. But the uniqueness of the filming location will likely justify the expense. Some cenotes are so beautiful that they seem almost romantically staged, such as when thick beams of sunlight penetrate the entry hole and bathe the underground world in shimmering light. The water is often so clear that divers feel like they're floating through air. Other cenotes could double as sets for horror films. In the Angelita cenote, a giant, circular hole, there is a 30-meter layer of fresh water on top of the saltwater -- as in most cenotes. Between the two is a billowing sulfate layer that looks like a blanket of muddy clouds. The branches of giant trees, submerged long ago, protrude into the twilight like dead fingers. Scenes like this help to explain why the Mayans felt that the cenotes were gates into hell. A 3-D movie is probably the most effective way to experience this fascinating world on dry land. But it could also endanger the cultural treasures of the cenotes, as the number of tourists visiting the caves is already growing rapidly. People are constantly making off with pieces of ceramics as well as human and animal bones. "Of course, this sort of film can increase the temptation," Huber admits. "But it can also promote respect for this world and the willingness to protect it." That could be critical for the exploration of the caves. As a rule, it isn't archeologists who make historically significant finds. Most are made by a small crowd of specialized divers who explore the caves in their free time and feed their results into the Quintana Roo Speleological Survey (QRSS) database. They have documented an incredible 1,053 kilometers of caves since 1990.